Do Sounds From Space Reach Earth? When NASA launches the James Webb Space Telescope in 2014, it’ll be the coolest man-made object in space. That’s not just an opinion. Webb will be working in temperatures as cold as the surface of Pluto as it trails our planet from 930,000 miles away with a tennis-court-sized shield blocking light from the Sun, Moon, and Earth. That means it needs to withstand a constant temperature of -389ºF, which is at least 100 degrees colder than previous spacecraft have ever endured. Designing a telescope for these cryogenically cold temperatures was a unique challenge for NASA engineers, since such extreme cold warps or cracks most materials. Even a millimeter of distortion is enough to mess up the meticulously calibrated telescope equipment. But NASA reported recently that a specially-designed material made from carbon fibers and a nickel-iron alloy passes the rigorous test: in temperatures as low as -411ºF, the sample structure shifted only 170 microns, or about the width of a needle. This is well within a safe range of movement, scientists say. With its cutting-edge technology, Webb will eventually replace the Hubble Space Telescope as the world’s premier observatory. In comparison to Hubble, Webb will be three-times further from the obscuring effects of Earth’s atmosphere and will be able to look much earlier in time—all the way back to the appearance of the first stars, some 13.4 billion years ago. 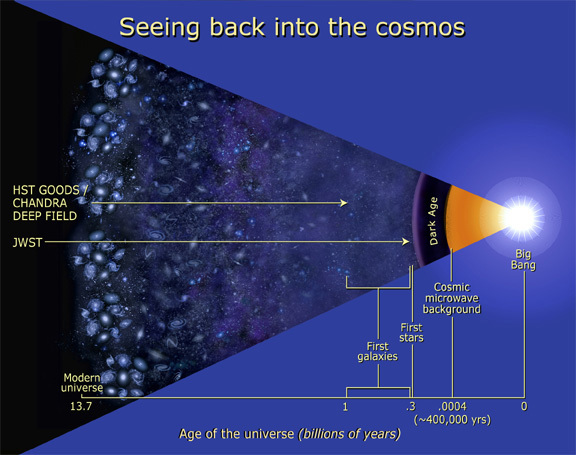 That’s astonishingly far back, considering that the universe is only about 13.7 billion years old. Sarah Fecht is a native of Syracuse, NY. She has loved Biology since a 7th-grade “Life Science” class and was one those rare people who went into college knowing what they wanted to study. She got a B.S. in Biology from Binghamton University, but got scared away from a research career at the prospect of narrowing her scientific interests into a thesis. Since then, she has retreated into the world of science journalism, where her interests have broadened to encompass astronomy, physics, conservation, technology and more.